If you have a small stream in your yard or neighborhood, you have probably noticed some changes lately. Heavy rains and flooding can cause erosion, especially in streams that do not have surrounding vegetation. As a result, streams will become muddy and have bare, steep banks! Streams that have shade and woody vegetation along their banks not only stand up better to flood events, but they also make much better habitat for native insects, birds, fish, and amphibians! 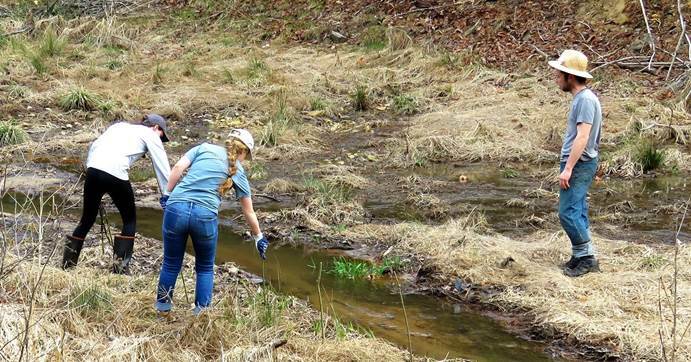 Conserving Carolina is a participant in the Shade Your Stream campaign created by Mainspring Conservation Trust, a campaign meant to spread awareness of the benefits of healthy, shaded streams in your own backyard. (Read more about why you should shade your stream here.) This month’s Habitat at Home will feature some tips on how get on the path to a healthier, shadier backyard stream! Here are a few ways you can promote the health of your back yard stream. Avoid mowing adjacent areas. 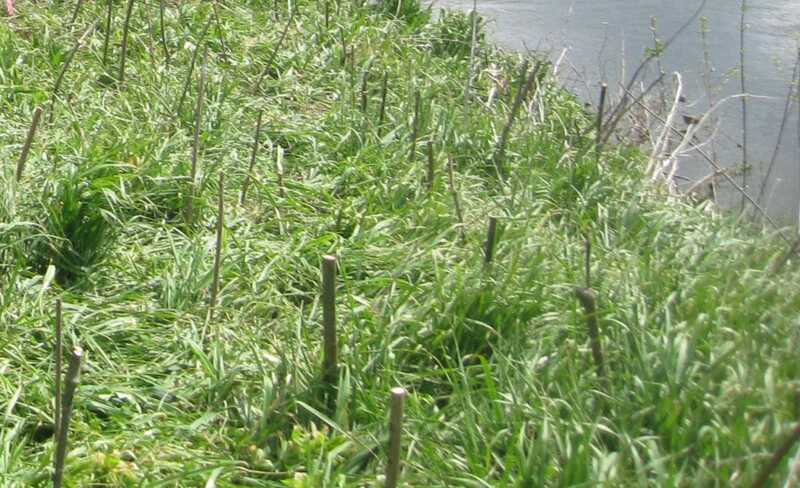 Instead of mowing or cutting the vegetation directly next to the stream bank, allow plants to grow and create a riparian buffer of about 15 feet. A riparian buffer is an area of vegetation between bare land (hard surfaces or mowed grass) and water that filters run-off and prevents stream bank erosion. Plant native plants. Native plants will not only provide erosion control and filter run-off, they will also provide the best food and habitat for native animals and insects. Region-specific riparian seed mixes are available if you are unsure about what to plant. This mix is specifically for the NC mountains! Live stake. Live staking is a process that includes placing the cuttings of certain tree species in the ground along a stream. When live staking is done correctly, species of trees/shrubs like silky dogwood, black willow, and elderberry, will regrow from the cutting to make an entirely new tree! You can even harvest your own live stakes if you already have these plants on your property. Eventually, live staking will provide excellent erosion control and habitat along your stream. Don’t Have a Stream? Here’s What You Can Do. See if your neighborhood, church, or place of employment has a stream flowing through it or nearby. Do some investigating – are the stream banks devoid of vegetation, or mowed all the way to the water’s edge? Do the stream banks look heavily eroded or is the water very muddy? If you the answer is yes to any of these, see if you can get permission to plant some vegetation along the banks. Planting even 1 tree or shrub can make a difference in the health and stability of a stream! Send us a photo of your stream bank! Conserving Carolina will give a free tree for planting along your stream to the first few individuals who send in a photo* (if you promise to take a follow up photo May 2020.) For those interested in live-staking projects and information on purchasing live stakes, contact kelly@conservingcarolina.org. Habitat at Home is a monthly segment dedicated to providing you with tips to make your yard and home a better habitat for native plants, animals, and insects. This month’s Habitat at Home is written by Kelly Holland with contributions from Land Protection Director, Tom Fanslow.